With 'Dreamin'', Vanessa Williams delivers a perfect piece of Eighties elevator music. Amazingly, it became the biggest hit from her debut album 'The right stuff' in the USA: it reached number 8 in the US Billboard Hot 100 chart. In Europe, the song was much less popular: it stalled at number 74 in the UK singles chart and it didn't chart in the Netherlands at all. 'Save the best for last' was written by Phil Galdston, Wendy Waldman and Jon Lind. It was recorded by Vanessa Williams on her 1992 album 'The comfort zone'. The song is about a person who stands by and watches as the object of her desires dates all of these different women, and then he finally decides to consummate a relationship with the singer. This single became the biggest hit of Williams' career, topping the US Billboard Hot 100 chart for five weeks, peaking at number 3 in the UK singles chart as well as the Dutch Top 40. 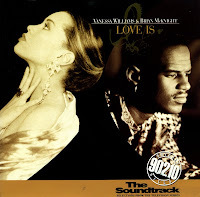 'Love is' was recorded in 1993 as a duet of Vanessa Williams and Brian McKnight. The track originally appeared on the soundtrack of the TV drama series 'Beverly Hills, 90210'. As a result of this exposure, the song peaked at number 3 on the Billboard Hot 100, becoming McKnight's breakthrough hit and another hit for Williams. The single also charted in Australia, where it peaked at number 49. In other territories, the single flopped. I bough this single a few years after its original release. I was quite happy to find this single because at that time, vinyl singles were becoming increasingly rare.